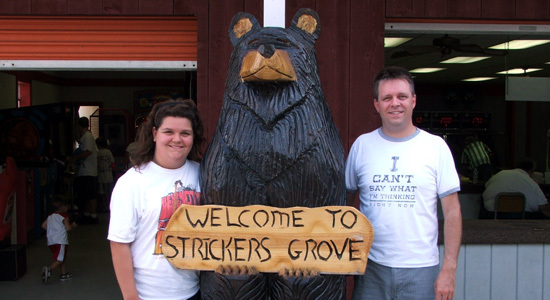 Today I surprised Sarah with a trip to Stricker's Grove in Ross, Ohio northwest of Cincinnati. It is a small private amusement park that can be rented out to corporations, churches and other groups. But today was just one of four days this year that the park is open to public. The park has two roller coasters and fifteen other rides. There is also a miniature golf course, a picnic grove, a large shelter house, banquet hall and plenty of large shade trees. The park was very clean and well maintained. The staff was very friendly. The food was good and was reasonably priced. All of this adds up to... dare I say it... charm. Sarah and I had a great time on the rides. The ride times on the flat rides were much longer than any of those at the large parks we have been to. To the point that while we were on Tilt-A-Whirl I was thinking about how I might ask to get off the ride. Sarah and I both got multiple rides on each of the parks two coasters. These mark my 112th and 113th coasters. Teddy Bear is a small wooden kiddie coaster. It is possibly the smallest woodie I've been on. Tornado is the park's largest ride and sits along the road at the front of the park. This red and white wooden coaster is a blast. Stricker's Grove is a great family owned park. Sarah and I had a great time. Click here to see our pictures from Stricker's Grove.